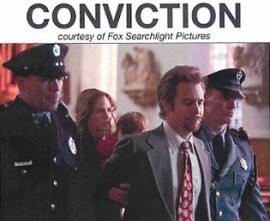 On Sunday, October 3, 2010, I had the privilege to view a pre-release preview of the award winning movie “Conviction” starring Hillary Swank, Minnie Driver, and Sam Rockwell. This film is an inspirationally true story. The older brother is arrested for murder and sentenced to life. The protagonist, played by Hilary Swank, dedicates her life to overturning her brother’s murder conviction by earning her G.E.D, attending college, and then law school. Eighteen years after conviction, Hillary Swank’s character teams up with the Innocence Project and Barry Scheck, played by Peter Gallagher to challenge the conviction through DNA evidence. Suspenseful! Moving! And a Must See!